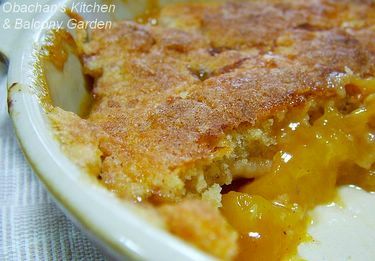 Nectarine Cobbler? I have to make it just to know what it tastes like. Obachan, is that a real quote "Those who deliver milk are healthier than those who drink it."? Where/who is it from? Your lovely pics always make me go hungry..You know, we deserve the best, flawless fruits...last Wed, I was at the night market and my friend asked if I wanted any of those luscious cherries..I said "No" cos they were very expensive. The next day, I went to the supermarket, saw them again...this time I told myself "What the heck.". I bought 22 huge cherries for about USD4.00...worth every cent cos I felt so good about myself when I ate them after dinner..LOL. Hmm. Those look more like plums than nectarines. 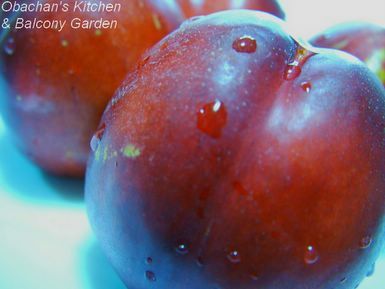 Are Japanese nectarines purplish? In the Northeast in the U.S., nectarines resemble fuzz-less peaches. It looks heavenly. I've been running into similar problems in Toronto with fruit quality. The only really good batch of fruit I had this year were some yellow plums (which I made jam out of). I guess it doesn’t taste too different from peach cobbler. I sure don’t know where/who it is from and now this is the only site I can find quoting that saying. You are so lucky to be able to buy that many good cherries for that price! Not really purplish … I think the nectarines in this photo look more purplish than what they actually are. It’s just this photo. To tell you the truth, I have never seen plums and nectarines next to each other so that I can compare, and I really don’t know how to tell the difference. Maybe the size is different? I heard that nectarine is a hybrid of peach and plum, so maybe some look more like peach and some look more like plum? I’ve always thought that you have better fruits in Canada, but maybe not? Anyway I’m glad to hear that you had a good luck with yellow plums. I just bought a giant slow cooker--a 7 liter. I would like to make yukibuta in my newly acquired slow cooker. Do you have any suggestions about what kind of things I should look out for? I saw that you made another type of buta in the slow cooker a while back. Can you think of any other type of japanese dish that may be amenable to slow cooker cooking. Good question. They were apx. US$ 1 each, which was not amazingly terrible, but 6 of them were packed together and they did not sell them as singles, so I had to pay apx. US$6 when all I needed was about 4 of them. I’ve never made yakibuta myself, so I have no idea what it would be like to make it with a slow cooker. Let me know how yours turned out. I’m curious. Yeah, I made buta no kakuni with my slow cooker and I liked it. The small recipe book that came with my slow cooker includes Japanese dishes like oden, nikujaga, simmered beans and chawanmushi. It’s the same thing here. They were available just for a couple of weeks and then gone, and I don’t know exactly why. My assumption is that those nectarines are grown in mid and northern part of Japan, and most shops in western and southern part seem to purchase certain amount only once. So when they sold out, or became too old to be on the shelf, that is it – no more purchase. Perhaps because nectarines are not very popular in Japan and the shopkeepers don’t want many leftovers when they are busy with white peaches which are far more popular?? I don’t know… Just a wild guess.